My MIL Ada likes to listen to Rachel Maddow before falling asleep, and as much as I love Rachel myself, I just can’t do it. She would keep me awake all night with worry. I much prefer reading fiction until my eyes are crossed and I can’t remember one sentence from the next. But since Charlottesville was invaded by Neo-Nazis, I can’t resist the news, even at night. Last night I caught a snippet of Rachel discussing the social media campaign to “out” the men (and they were mostly men) who showed up in golfing attire with helmets and assault weapons. It seems the KKK types no longer feel the need to hide behind hoods and masks. Still, I felt slightly queasy, because it’s so easy to host a website that “names and blames” the people who attended that white nationalist/supremacist rally. These men are now losing their jobs. It’s like being put on a sexual predator list, only instead of thinking a pervert lives next door, they think a racist bigot is mowing the lawn. “Hi, how’s the weather?” And it reminds me why I don’t like being put on any list. The Nazis in Germany made lists of Jews and anyone else that opposed their propaganda. The radical Christian right made lists of abortion providers. I’d rather we discuss why those men from Pennsylvania and Ohio and North Carolina, those weekend “Warriors for Christ” as one proclaimed himself to be, were better armed than the police sent to guard everyone. And even though a car was used to kill Heather Hyer, a peaceful counter-demonstrator, a modern day abolitionist fighter, and two VA State Troopers died while on duty protecting everyone in Cville, that scene was potentially a powder keg for an all out riot with guns blazing and many more lives lost. At that time I was using my camera to take pictures for my blog, so it was always on me. Meanwhile everyone else was streaming past us with their cell phones! We mentioned this fact to the official screener, “You know, every cell phone has a camera, right…?” She just shrugged her shoulders. Inside the open-air concert, the first band was warming up as Bob walked back to his car in a parking lot on the other side of the Mall with my camera. Virginia is an open-carry state. That’s why all those white militia men waltzed around looking like Rambo out for a stroll. Whatever your politics, allowing the NRA to make public policy that would endanger all our citizens, including the police, is madness. I don’t care how long it took our little potentate to respond to Charlottesville. His true nature is making itself clear. I do care about our country, and I want that pendulum to swing back quickly. We must start passing common sense gun laws and stop trying to take health care away from millions. The vitriol must stop, we cannot let anger and hate win. Naming every single one of those vile men who chose to carry weapons into my adopted hometown is going low, and I ‘d rather be like Michelle, and go high. Yesterday, we visited Parnassus, my favorite book store in Nashville after Kindergarten. Let’s remember, we teach our children how to hate and fear “the other,” but it’s never too late to teach them how to be kind, how to love. 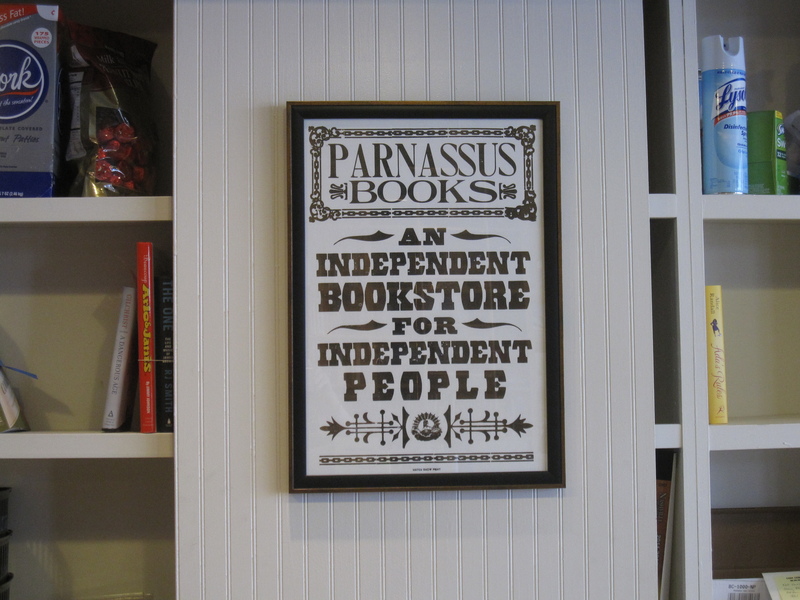 As some of you may know, I signed up to follow the Parnassus Bookstore blog, Musing, almost as soon as it launched. I follow its editor, Mary Laura Philpott, on Twitter too. 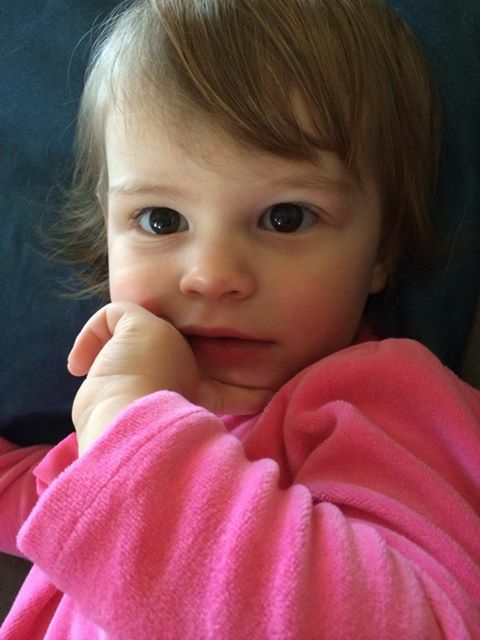 It’s a fun way to keep up with literary happenings in my daughter’s adopted city, Nashville. 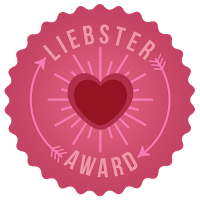 And a recent post on Musing made me wonder if I had ever been afraid to read something, anything. I won’t go to horror movies, but that’s different. I’m aware that I’ll read crime and mystery novels only on vacation – like the Girl With the Dragon Tattoo series – but me, afraid to read something? Never! In “Reading (and Writing) Through Fear” Philpott reviewed a book that she admits she normally wouldn’t read. 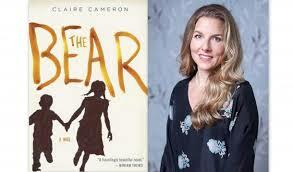 The Bear, by Claire Cameron, is written from the point-of-view of a five year old; a terrified child who has just witnessed a bear kill her parents. Certainly horrific territory, and granted it is maybe a book I would pick up in a bookstore, read the jacket, and put down. Not necessarily because I’d be frightened by the content, but when you have lost a family as a child, as I did in my first year of life, it’s not something I would want to read about. In the same way that Bob doesn’t like to see war pictures, since his work is sometimes like a war zone. He gets enough adrenalin in the ER. …my sons were born. The first time a babysitter came over to look after my six-month old, I stood outside the front door and could barely make myself walk away. It was, I realized, a new kind of fear. It’s one that comes alongside loving someone else completely, be it a child, partner, lover or friend. The world is big. It can be scary. And I couldn’t protect the people I love at every given moment. So I bought the book. Because it’s always interesting to see how an author finds the authentic magical thinking voice of a child. And because I knew I was deep-down afraid to read it. And the only way to keep growing, is to challenge that fear. And today I’m going to read The New Yorker article, “The Reckoning” by Andrew Solomon, about his interview with the father of Adam Lanza, the Sandy Hook killer. This really scares me, but I hope that some insight for some struggling parent out there will come through his words. When I heard Solomon say on a news show that Adam’s mother Nancy was more interested in Adam having a “good day” instead of a “good life” it sealed the deal. Sometimes a parent can live in so much denial, they begin to believe in the insular, sclerotic world their child has created. A world in which the bear is the child himself. Patchett was talking about taking care of her grandmother as she was dying. It was supposed to be her sister who stayed at home, in Nashville, and would be the family’s caretaker. But instead, tables turned and her sister moved away just as Patchett agreed, after an eleven year courtship, to marry her boyfriend Karl. She was still smarting after a brief early marriage. 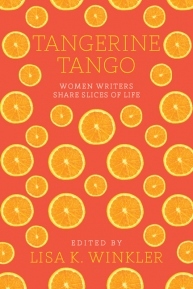 That essay too is included in her new book, This is the Story of a Happy Marriage. I’ve yet to read her new book of essays, but after listening to her interview, I’ll have to wait until I return to the Love Bug so I can purchase her book in her bookstore, Parnassus. And no, she wasn’t pushing her bookstore with Terri Gross, but she was extolling about her love of independent bookstores. And I found myself agreeing with her. I had returned home and was keeping watch at my foster father’s dying bedside when my MIL Ada found me and pulled me into Bob’s hospital room. He was recovering from some minor surgery and thought he was hallucinating. His vulnerability matched mine. We met at fourteen, and married at thirty. And so our story resumed, the he.went.to.woodstock (meets) she.went.to.westchester story. I’m glad Ada kept most of my newspaper articles, faded yellow paper over the years. There was no Cloud to store and collate all my writing, but my MIL who will be 90 this year, became my biggest fan and super star archivist over the years. I may have to scan all those essays for posterity. They are like all the pictures stored away in boxes, waiting to be digitized on some rainy day. But first I’ll catch up on all things Nashville on Parnassus’ new blog http://parnassusmusing.net it’s for anyone who loves to read – period! The nine hour drive home from Nashville can be eye-crossingly boring. I reluctantly passed by Dollywood in favor of listening to the continuing saga of a Janet Evanovich audiobook. One McDonalds with Elvis all over the walls blends with another rocking chair on a Cracker Barrel porch until the Blue Ridge Mountains appear just in the nick of time. Only a sporadic NPR signal saved me from driving off a cliff. Listening to the White House Press Secretary dance around good ole Biden’s plainspeakin’ ways and say that the President’s opinion on gay marriage “…is what it was” made me smile. And now the Republicans would just love to force his hand on this, but don’t let them set the agenda for us Mr President. If Mitt could carry his dog on top of his car at one time in his life, we know he wouldn’t do that again today. If Mitt can embrace health insurance reform in MA, we know he can and did ‘evolve’ and would like to destroy it for the rest of us. Surely Mr President, you can continue to help breathe life into our Constitution. Remember that gay rights are human rights, and that words have meaning. 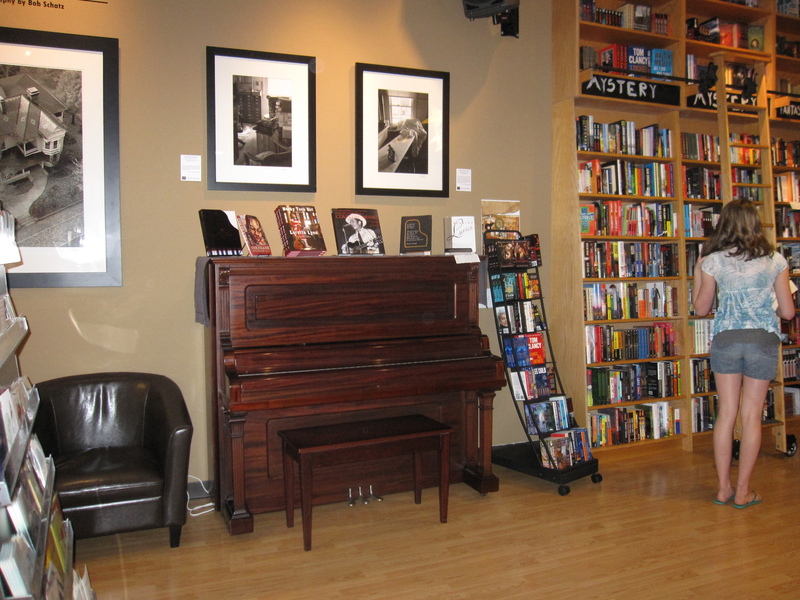 Here are some shots of Ann Patchett’s independent bookstore in Nashville where anyone can stroll in and play the piano. Browsing among books is a guilty pleasure for this word nerd. We Americans are an independent lot. We respect truth in politics, and in fact we long for it. We give you permission Mr President to keep evolving, along with the rest of us.